The Dollar/Yen fell on Thursday as the European Central Bank sent a chill through markets across the globe after slashing its growth forecasts and indicating interest rates would remain at historically low levels. Earlier this morning however, the USD/JPY corrected slightly after Japan released better than expected GDP figures coming at 0.5% vs 0.4% QoQ and 1.9% vs 1.8% YoY. Japan also released a much better Household Spending which increased to 2.0% vs -0.5%, adding more pressure on the greenback. Looking ahead, traders will focus on the US jobs report to be released later during the day, as the Japanese Yen will take cues from the broader market sentiment and stock markets dynamics. 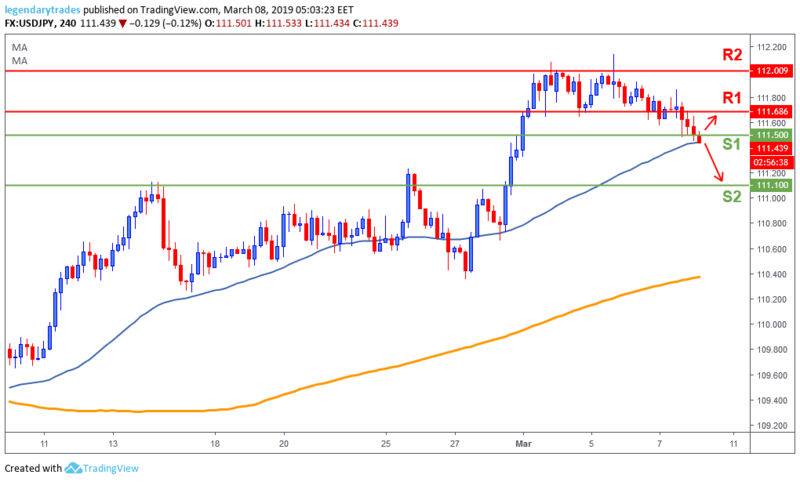 The Dollar/Yen broke below 111.50 (S1) and is currently testing the 50-day moving average which has acted as an important support throughout the recent uptrend. if price breaks below this level, we will likely see further weakness towards 111.10 (S2). Alternatively, the bulls need to break back above 111.70 to stop this selling pressure.